This morning Intel and Google ran a ChromeOS-based event. Navin Shenoy, Vice President of the PC Client Group and general manager of the Mobile Client Platform Division at Intel, ran the event. The whole event was a platform to basically announce new devices from manufacturer partners, all running on the new Bay Trail processor. He introduced Caesar Sengupta VP Product Management at Google. Caesar spoke about how Google is paying attention to user feedback from places like Amazon. He spoke about the top 6 laptops arranged by user feedback on Amazon are are Chromebooks. ChromeOS is constantly expanding and evolving, in fact every 6 weeks they receive an update. 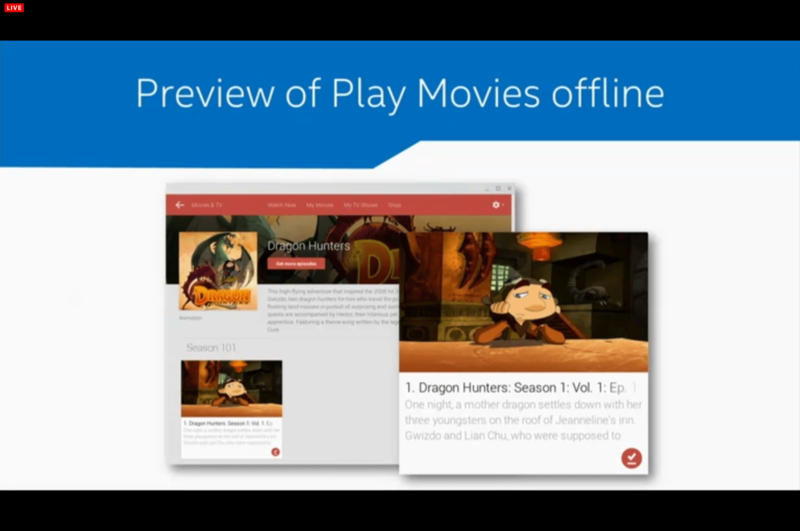 One of the big ones will be Play Movies which will receive offline support over the next few weeks. This is for use on Airlines or underground in train stations. It seems Google is aware of criticism of offline support in ChromeOS, so they are making a big push with this. Just like offline Google Docs editing, Google is aiming at making ChromeOS accessible for everyone, everywhere. Navin went through the range of current ChromeOS devices from Toshiba(CB30), HP(HP Chromebook 14), Acer(C720P) and Asus Chromebox. 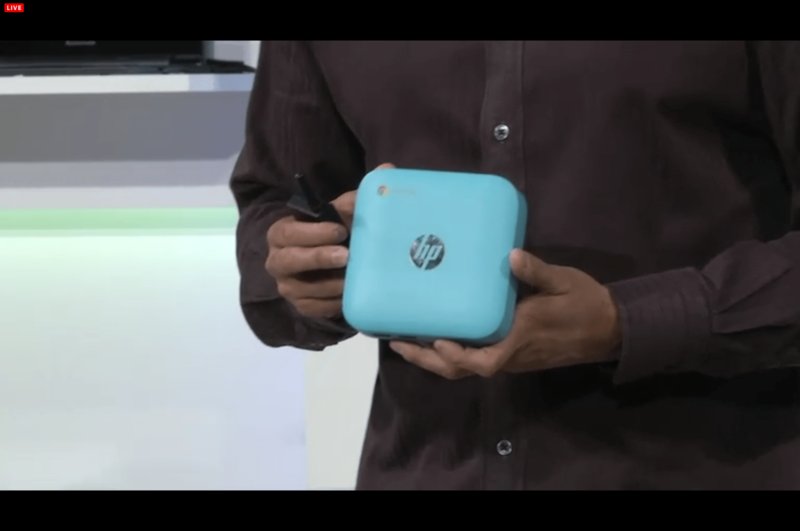 He then showed off the HP Chromebox which will be launching in the US in June running on the Haswell platform. Navin then spoke about how performance is the number one feature that users requested. Intel is a top contributer to ChromeOS and Blink – the rendering engine behind Chrome. Because of this, Intel apps will run 4x faster than other apps, productivity apps will run up to 3x faster and Google Apps like Hangouts, Docs and web browsing will also run better. A brief demo showed an Intel based Chromebook vs a ‘non-Intel’ system (Samsung Exynos based Chromebook) in a hangout with Google Docs and also in a game, showed that the Intel device was superior. There was a brief introduction of a new Acer Chromebook running an Intel Core i3 processor, similarly a Dell chromebook was shown off that will also be running a core i3 processor. But unfortunately we’ve never seen a Dell Chromebook here in Australia yet, we’ll be following up with Dell today on this new model. Haswell based systems have been the common theme since the Intel Developer forum last year, but times change. Intel is now bringing Baytrail to ChromeOS. Four OEMs are now onboard to deliver these new Baytrail based systems: Asus, Acer, Toshiba and Lenovo will be releasing Baytrail based Chromebooks over the course of the year. The Lenovo N20 will be available in the US in August, the Acer Baytrail Chromebook will be launched in the US later this year. He showed two Asus Chromebooks which appeared to be the Asus C300 but wasn’t named, which he said will be based on Baytrail and available in the US in Summer, he then showed off the Asus C200 which will offer 11 hours of battery life. There will be additional OEM systems aimed at Education, the Lenovo Thinkpad Yoga and an Intel reference design, which will now run ChromeOS rather than Windows, witha camera in the lid which will flip around, a company called CTL will bring it to market later this year. Baytrail is optimised for power, performance and cost. Bay Trail enables OEMs to offer over 11 hours of battery life, Wifi 802.11AC, Fanless designs that are thinner and lighter. Navin spoke about how all the new Intel Bay Trail processors will be using conflict free minerals in their manufacturing process. 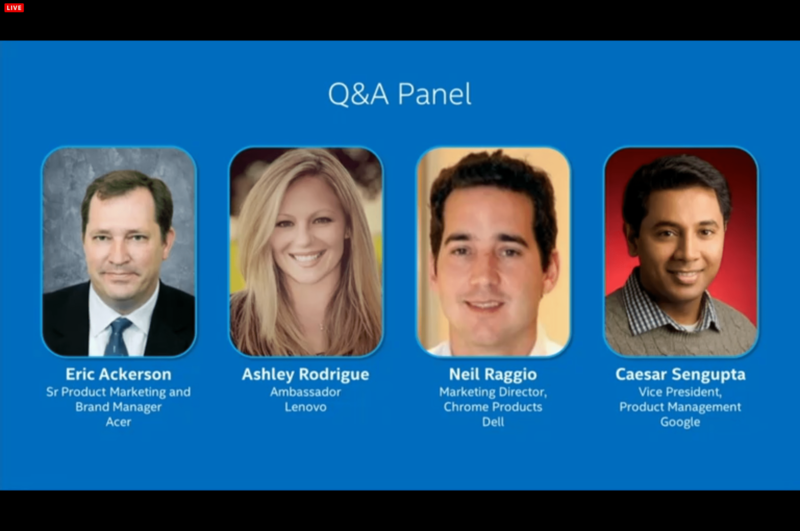 At this point Eric Ackerson, Senior Product Marketing and Brand Manager for Acer, Ashley Rodrigue, Ambassador for Lenovo and Neil Raggio, Marketing Director, Chrome Products for Dell joined Caesar Sengupta from Google and Navin from Intel on-stage to answer questions. Caesar spoke about how there are a lot more models in the market now, offering many different options such as screen size, colours and touch options. The subject of resolution was brought up, the fact that most Chromebooks are coming with the same 1366×768 display resolution, this was deflected and not really addressed although Ashley from Lenovo said HD screens are coming with touch in their range. Both of their N20 and N20P are 10 point multi-touch screens. They are basically looking at what people want in their Chromebooks and reference devices before moving forward. The subject of ChromeOS tablets was raised, Caesar said that touch is a big part of the user experience and based on user feedback they will bring in tablets if that’s what they want. Lenovo spoke on whether ChromeOS devices will eat into Windows based sales. They said they are more about offering technology across the board and not a concern. Questioned as to whether they will be bringing out higher end devices. Navin said that they will have better technology with the Bay Trail devices – thinner, fanless, faster. Navin pointed out that Google is setting up whats possible with the reference device – the Pixel, but no Pixel successor was announced. Eric from Acer said customers will expect more from hardware as software improves, but they are concentrating on the Bay Trail processors at the moment. Dell re-iterated future products will come, but Bay Trail is where we’re at. Ashely from Lenovo said that they offered a lot more in terms of toughening the laptop, showing off the strengthened features on their educational model. Another question was posed to Caeser surrounding the fact that there are now, with the launch of the Lenovo N20P what is effectively a ChromeOS tablet and OEMs are announcing Android clamshells – obviously referencing the HP Android laptop that leaked. Caesar says Google is clear on this, that they are waiting to see what works for users. This ended the Chromebook event and attendees were invited to go hands-on with the new devices. Summing up there are now new models from Acer, Asus, Dell, HP, Lenovo, LG and Toshiba announced. From Asus we have the 11″ C200 Chromebook and 13″ C300 Chromebook. From Acer and Dell we will see new Chromebooks with Core i3 processors. Lenovo will offer the N20p Chromebook and Thinkpad YOGA 11e Chromebook. HP will offer a new Chromebox and Toshiba will have a new Chromebook, LG will also be bringing the Chromebase to market. A lot of the announcements are US-based and advised availability ‘in the next few months’. We will be following up with Acer, Asus, Dell, HP, Lenovo and Toshiba to find out about their new models. LG has advised that the LG Chromebase should be in-stores this month. so, (sorry if I missed it in the article) what will be the first chromebook available in Aus with bay trail, and when? We’re asking our local branches about availability here, so far nome have advised anything about local availability but doesn’t mean they aren’t coming. Any update on local availability? Not yet, all the manufacturers we’ve contacted have advised there is no information to share at this time. We’re on them though, we’ll advise as soon as we hear anything.